Thisstory was updated at 10:25 a.m. EST. A dozenastronauts in orbit took a break from their orbital work Thursday to celebratea weightless Thanksgiving, despite the fact that they?re flying on twodifferent spaceships. The shuttleAtlantis, with seven crewmembers onboard, left the International Space Stationearly Wednesday, capping off a week-longvisit to stock the outpost with spare equipment. The orbiter is slated toland Friday morning at NASA?s Kennedy Space Center in Cape Canaveral, Fla. In honor ofthe American Thanksgivingholiday, NASA replaced the shuttle?s icon with a traditional turkey imageon its Mission Control map tracking the spacecraft around Earth. The shuttleastronauts can choose from their normal space menus, or select from NASA?straditional meal of irradiated turkey with cornbread dressing, green beans andcandied yams. The five people on the station also took the day off for the U.S.holiday. ?Thanksgivingto me has not always been not about the food you eat, but the company you keepand I?m keeping some outstanding company here,? said Atlantis commander Charlie?Scorch? Hobaugh in a series of televised interviews today. ?I can?t wait tosee my family when I get back and have a Thanksgiving meal with them a littlelate, but in the meantime I?ve got a great group of friends and I?m thankfulfor that.? WithHobaugh on Atlantis are shuttle pilot Barry "Butch" Wilmore andmission specialists Randy Bresnik, Leland Melvin, Mike Foreman, Robert Satcher,Jr. and Nicole Stott. Stott is returning home on Atlantis after nearly threemonths living and working on the space station. The astronauts recorded a specialholiday message for Earth from the flight deck of Atlantis. Bresnik isespecially thankful to be heading home. His wife Rebecca gave birth to theirnew daughter Abigail - the couple?s second child - on Saturday while he was inspace. ?I can?timagine anybody wanting to miss their daughter?s birth, but hopefully when she?solder she?ll forgive me for being absent,? Bresnik said. The new astronaut-dadsaid he felt lucky he would get to meet his new baby girl just a week after herarrival. Many military personnel deployed around the world don?t get thatchance. ?On thisThanksgiving, we?ve got to remember the military folks who are deployed aroundthe world,? said Bresnik, a Marine Corps lieutenant colonel. ?Our thanks todaygoes to them for the service that they give, especially those who are not ableto be home to see their children right away.? Hobaugh?s shuttlecrew left behind five colleagues on the station led by NASA astronaut and newcommander Jeffrey Williams, who tookthe helm Tuesday. Along with him on the orbital laboratory are EuropeanSpace Agency astronaut Frank De Winne, Russian cosmonauts Roman Romanenko andMaxim Suraev, and Canadian astronaut Bob Thirsk. 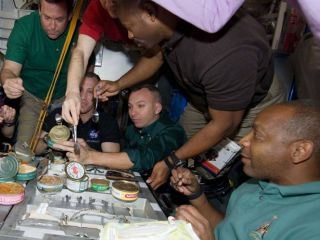 "As wefly high over planet Earth during this holiday season, we have the privilege ofsharing a global variety of delicacies with our station crewmates from Russia,Canada and Belgium," Williams said. He and Stottmade a video to show some of the space food they'd be eating on Thanksgiving,including cauliflower and cheese, creamed spinach, fruit cocktail, and spicygreen beans. The space station and the shuttle Atlantis can be easily spottedin the night sky this weekend to some viewers on Earth. "Unfortunatelywe don?t get to make green bean casserole, but this is about the next bestthing," Stott said. "During this holiday season we of course miss ourfamilies and our friends back home, but we're enjoying every minute of ouradventure." Stott has ahusband and a young son in Houston. She said she?s looking forward to seeingthem again, as well as having a drink of Coca Cola and a New York-Style pizzaafter she lands. Stott?s crewmates will set up a special recumbent chair forher on the middeck of Atlantis. The seat will allow Stott to return to Earth ina reclined position to better adjust to feeling the tug of Earth?s gravity forthe first time in months. The Atlantisastronauts plan a relatively quiet day in space, spent doing final packing andcheckouts for landing, slated for Friday at 9:44 a.m. EST (1444 GMT).